It's one of the countries that in my mind I need to be watchful of - when I see a Made in the Philippines tag I start wondering about the conditions in which the clothing might be made. It's up to responsible brands to ensure that sourcing from countries such as the Philippines treats the people there fairly. Today I found a blog from a student in Manila - in this post SPIRITUALITY PAGE: Children in poverty Kebelle provides an insight into a world far from the UK, (a world far from his own in Manila even). A comment maker focussed on Kebelle's thought - "What they need is not actually charity but empowerment. They need respect. They need their dignity untouched." That is why fair trade is important and why I view that we in the West spending a little extra to buy responsibly is at least as good as, and perhaps in the long term far better than, putting the same money into a charity can. With a name like Wombat you'd expect this company to be at the niche end of the market - you may also expect them to be Australian but in fact they are based on Deeside, Cheshire, here in the UK. Wombat products are available through Pier 32's promotional clothing directory - you can search on the Wombat brand to see what is available. There are a range of products made from regularly sourced cotton. Here we look to Wombat's ethical policy to find out what is going on. It asks its suppliers to adhere to its own code of conduct and reserves "the right to run audits and spot checks by themselves, or by external parties, on suppliers’ premises without prior their knowledge to verify that they are behaving in an appropriate manner". Wombat is not a big company (they were only established in 2004) so perhaps we have to be realistic about how far they can go in carrying out audits (and there is no mention on their site of any having actually happened) but to the extent that cotton is supplied by Fairtrade suppliers there will be some clear assurance to be gained. Wombat also have a variety of good environmental practices in place here in the UK. As well as recycling Wombat is "working towards all suppliers complying with the requirements of the Azo dye directive and Nickel directives "
You can see their ethical policy here. As always Pier 32 looks forward to receiving any further information that can help our assessment of any of the suppliers of the products we sell. 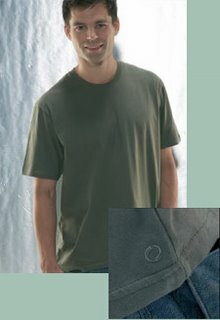 Gildan are not a brand on the tip of the tongue - but they are big.... In 2007 they sold over 500 million t-shirts, sports shirts and fleeces worldwide and no less than 320 million pairs of socks. They are based in Quebec, Canada a country with a liberal tradition and a global outlook. However like most developed countries it's finding it tough to keep its own people employed - at least in manufacturing. Unfortunately 2007 saw the closure of Gildan's remaining Canadian and U.S. textile operations - "these closures were necessary for us to remain a leader in our industry against Asian imports and other global competition". So, if Gildan are 'against Asian imports' then where do they import from? As an interesting alternative to the ubiquity of South East Asia, Gildan employ more than 15,000 people worldwide mainly in Honduras, Haiti, the Dominican Republic and Nicaragua. There are people in China - but only to help distribute their product there. And Gildan practice direct employment, not the use of independent sub-contractors, so control over what goes on in the company's manufacturing is all down to Gildan. So is it living up to its ethical statement set out above? Probably yes - "On June 13, 2007, Gildan obtained accreditation from the Fair Labor Association ("One Sweatshop Is Too Many") for its labour compliance program, thus becoming the first vertically-integrated manufacturer in its industry to achieve accreditation." And according to elsewhere in the report, the first "basic activewear apparel manufacturer" (there's a mouthful!) to achieve this status. You can download Gildan's 2008 Corporate Citizenship Report here. violations at Gildan Activewear El Progreso." The Fair Labor Organisation got involved but before promised remedial actions could be carried out Gildan closed the factory. "Gildan claims that the decision to close the factory is "absolutely unrelated" to the investigation of worker rights violations at the facility and to workers' efforts to unionize." See the report for more. This recent matter has been discussed in various places on the web (here's an article from 2004 on the Ethical Corporation site) however I could not easily find anything else while digging. Also seeing the Fair Labor Organisation involved both in 2004 criticising the company and again in 2007 giving it accreditation does point to the company making sure that its remaining factories do not repeat the alleged errors in Honduras. So there we are, yes there's a blot, but all apparently sorted out now and Gildan are doing pretty well wearing their ethical badge (unless, of course, you worked in one of their closed plants). As ever let me know if you can usefully update me on Gildan's status or activities. We are excited to be able to soon expand our organic options when Starworld, our Egyptian supplier from whom we purchase most of the ethically produced T-shirts, Hoodies and other cotton garments that we supply, make available a range of organic garments. The new range is going to be tagged "Fair Price" organic and will be made from the finest 100% organic cotton fibres - "The garments are 100% organic - we do not use cheaper 'organic: in conversion' fibres - only fully certified organic cotton" say Starworld. Indeed, the shirts are to be certified to GOTS (the Global Organic Textiles Standard) by the internationally respected Netherlands based Control Union. Starworld is a manufacturer that have supplied Pier 32 with ethically manufactured t-shirts for many years. They insist that no corners will be cut to achieve a "Fair Price" and that price will enable the promotional clothing buyer, who has previously assumed that to look at the organic option is cost prohibitive, to think again. "We know that there is a growing demand for organic cotton promotional wear in the wider marketplace: printers and embroiderers are interested in promoting organic alternatives, and their customers want to buy organics. However, those customers are still working to budgets that rule out the highly priced products from most other suppliers. Affordability is key, and that's just what the Starworld Organic Cotton range delivers". The Starworld Organic Cotton range of T-Shirts and other promotional clothing will be available from March 2008. Look out for the forthcoming update of our site! In looking behind the ethical stances of large companies, what is there to help them set their standards and monitor against abuse? "The Ethical Trading Initiative is a ground-breaking initiative which brings together a wide range of organisations from all parts of society. Together, we aim to improve the lives of poor working people around the world. Specifically, we are an alliance of companies, NGOs and trade union organisations working to promote and improve the implementation of corporate codes of practice which cover supply chain working conditions." The "Base Code" sets out most of what you might like to see in an ethical statement. A recent article in the Guardian's Ethical Living blog outlines how George at Asda has just added a £5 woman's office outfit to its range. "However, anybody who is worried about the ethical implications of the clothes can rest easy, it goes on to say that its dedicated sourcing team has ensured that it is sourced in line with the Ethical Trading Initiative's code of practice. Well that's OK then. Or is it? " I have a little problem with organisations that are set up to guide members by a set of rules that the members set. What's to stop Asda, Boots and the many other members giving themselves a set of standards that abuses can wriggle through? Well, in the case of the ETI there is the fact that the membership includes Trade Unions and NGO's such as Oxfam, Africa Now and Save the Children. So ETI gets a tick but the nagging question still remains in my mind as to how a business suit can be sold for £5 without a few people along the supply chain feeling somehow short changed. Asda (owned by Wal-Mart) sets out its ethical stance here. Ethical choices for Valentines Day! The UK's Department of International Development have set up a page on their website extolling us to "Buy ethical gifts on Valentine's Day to help make poverty history" with encouragement to buy Kenyan roses explaining how "Roses flown in from Africa can use less energy than those grown in Europe". It's about the wasteful heat need to grow them in greenhouses close to home. We like the Action Aid offering - get out there and buy the ultimate Valentine's gift - not a coat, a goat! At the niche end of the market for promotional clothing lies Okarma which brings to the market a small range of organic t-shirts, hoodies and polo shirts. Like Continental it is 100% organic but it goes further in that none of the cotton used is organic cotton in conversion. It is a small company operating out of Devon (a county now advertising itself to tourists as the home of the green lifestyle in the UK - home incidentally to our printing presses). Its cotton is grown in India. "From farm to factory, our organic cotton is inspected, evaluated, labelled and stored with complete traceability and transparency of procedure. Furthermore we have committed to long term partnerships with each of our suppliers, and we use our influence to seek fairness in the workplace, with improved conditions and wages for everyone involved in the different stages of manufacture." Unlike the biggest brands in clothing with their detailed policies on ethical trading and the supply chain and multi-layered inspection programmes, one suspects that one has to rely on close contacts and assurances with Okarma. In the organic industry one anticipates there will exist a healthy regard for the rights of human beings as well as the environment however in the absence of inspection programmes one cannot know it 100%. We carried out a quick search on the web to see if there might be any skeletons in the closet for Okarma. Nothing came up. So in providing our customers an organic and ethical t-shirt choice Okarma seems to be a good brand to go with. Ask for it by name or look for it in our Clothing Directory. 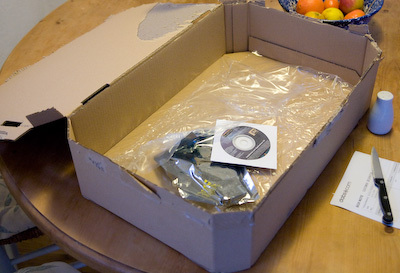 Now I reckon that they could have safely packaged 20 cards in the space made available for this one. Instead they seem to have a single size container which I assume saves them money because of economy of scale. It's not the excessive use of cardboard which is most serious here - at least I can recycle, but not all people do, and recycling itself has a environmental impact. The big issue is the fact that there are 19 more vans than there need be trundling around the countryside contributing collectively to environmental harm.